Cutting Services - Steve's Bindery Service, Inc. Cutting the paper is without a doubt the single most important step in the process of producing a high quality post press product. At Steve’s Bindery Service, Inc., we use computerized and calibrated digital paper cutters that use high-pressure hydraulic clamps to hold stacks of paper material in place and prevent paper shifting. A razor-sharp carbon steel blade then makes perfectly precise cuts. Our professional staff will accurately cut and trim your order to the required size to ensure a quality end product. Our Lawson 47” MPU paper cutter ensures precise cuts without damage to the print material. From its cushioned hydraulic clamping mechanism to the programmable backgauge computer, the Lawson 47 is the right choice for most cutting projects. It can handle 6” stacks of paper up to 47” wide. Our Polar 45” paper cutter with a RAB-8 jogger can be electronically programmed to cut, allowing for the complete automation of the cutter. It cuts paper up to 45” wide in 3.5” lifts. The jogger is used to ensure the pieces of paper in a stack are perfectly aligned. It does so by vibrating the stacks of paper. Steve assists customers in determining the quantity of sheets possible out of a larger parent sheet. He can also help you determine the layout of your cut so that you will have the least amount of waste. 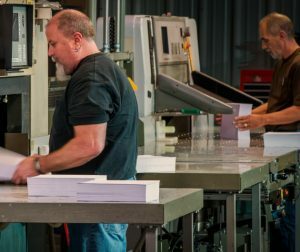 At Steve’s Bindery Service, Inc., we meticulously maintain our equipment to minimize downtime. This not only ensures customers’ orders are completed on schedule, but that they receive the highest quality finished product.